In the 1840s and more seriously in the 1860s war broke out as Māori sought to defend their land and local authority from a growing European population. In this image, from the end of the wars in Waikato in 1864, Gustavus von Tempsky portrays a group of Māori preparing to fight. Von Tempsky was a Prussian who commanded a company of Forest Rangers, drawn together in the hopes of matching Māori bush tactics. 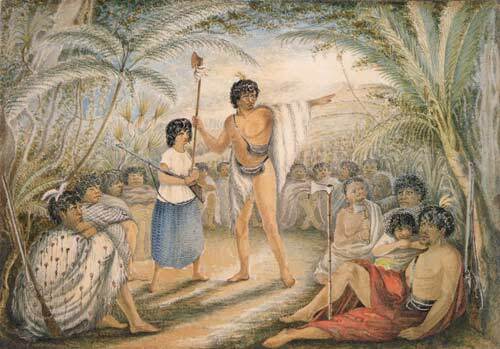 He was eventually killed in Taranaki in 1868, during the conflict with the outstanding Māori military leader, Tītokowaru.